Happy Sunday! Yesterday, our smoky skies cleared for a time, it rained a bit, and we were happy to see our beloved mountains. More than a million acres have burned in Montana in the past six weeks, and on most days we have not been able to see the mountains that surround us. But, even on the days we haven't seen the mountains, we KNEW they were still there. Faith is the same--it is the thing that assures us that God is working in the background even when we don't see it. When we are praying and waiting on Jesus to answer, we have hope that He will act. 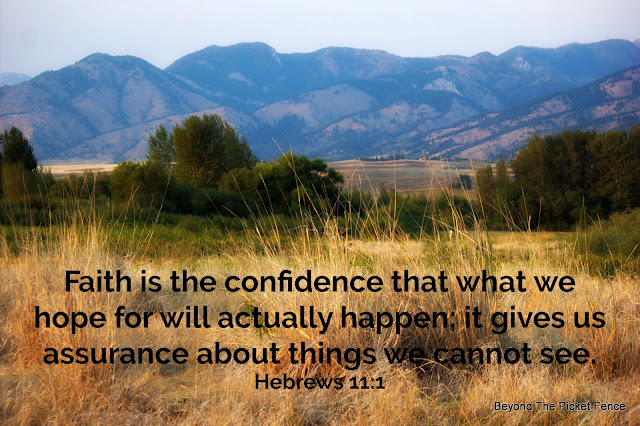 Faith enables us to trust in KNOWING that God "has got this" whatever this may be. Faith helps us to keep going even when we don't see the whole picture or know the entire plan. This week, let's practice resting in faith. Today was the first time in quite a while that we also had clear skies without smoke and that is due to a rain we had last night. We have many fires burning here in Oregon as well. Couldn't look at the sun during the eclipse, but with all the smoke lately blocking the sun & making it bright orange I could look right at it! Thank goodness our air has cleared here in Washington. Praying for those suffering from the hurricanes, fires & earthquakes.